We are finally on our way from Sardinia to Napoli on the Italian mainland, where we will be mooring Nimmie for the next 12 months. We flew into Alghero on Friday morning with Jase and Lee who are helping us move her the 300 plus miles. 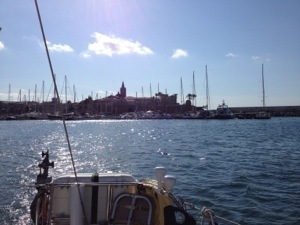 We set off from Alghero on Sat morning, having spent Friday getting her ready, including Lee fixing our outboard! Friday eve was spent at Pesce d’Oro, our favourite restaurant. It was a fond farewell to a place we had come to really like and the marina had looked after Nimrod well. After an 18 hour trip – all bar two hours motoring – we arrived in the Maddalena islands on the NE coast of Sardinia to one of our favourite spots. Deadman’s Passage is a beautiful location with turquoise seas and quiet beaches on the island of Budelli. This is also where the famous Pink Beach is located although it is closed to the public. You have to admire it from afar! Arriving at 0445 meant that we had to carefully pick our way through the rocks and pick up a park authority buoy. We then went to sleep for the next few hours only to woken by the park rangers wanting their mooring fee. After a lazy breakfast, we went exploring and had the beach to ourselves for a time but being a Sunday afternoon the locals had other ideas! It was warm enough today to sunbathe on the beach and even go for a swim! 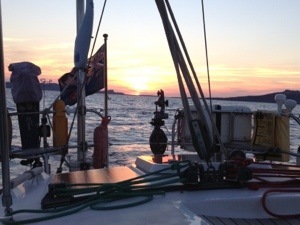 A quiet evening ahead before leaving at midnight for our 30 hour trip towards the mainland of Italy. 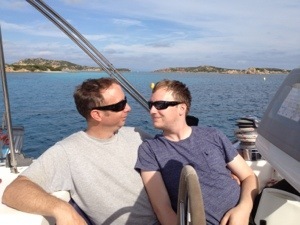 We are planning at stopping at the Pontine Islands sometime on Tuesday. Pictures below of a last view of Alghero, sunset last night, Jase and Lee whilst moored in Deadman’s Passage and the beach on Budelli.